Can't decide which of our fine green tea bag products to order? 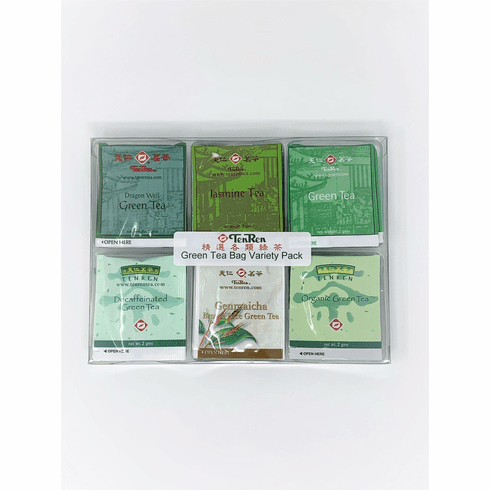 TenRen's variety pack lets you sample six of the following popular green teas: five Green tea bags, five Dragon Well tea bags, five Organic Green tea bags, five Decaffeinated Green tea bags, five Genmaicha (green tea with roasted brown rice) tea bags, and five Jasmine (green tea scented with Jasmine flowers) tea bags for a total of thirty tea bags for your enjoyment pleasure. Available in boxes of 30 bags. Shipping weight is 0.3 lb.